IN early August, Jorge Sanchez, a broker with Douglas Elliman, flew to Buenos Aires to sell some Miami real estate. He returned to Florida a few days later with four signed contracts from Argentines for apartments in a 60-story tower in downtown Miami. The fact that the buyers signed the contracts without ever flying to Miami to see the building — Opera Tower — speaks volumes about how eager, and desperate, Argentines have been to direct their money out of their country and into real estate in Miami and New York. In the past few months, Argentines have quietly passed Brazilians to become the most active group from Latin America buying Miami real estate, according to Millie Sanchez, executive vice president of development marketing for Douglas Elliman Florida. Brazil’s demotion from the top spot likely has something to do with the weakening of its currency, the real, versus the dollar in recent months. But in Argentina, a weakening peso and 25 percent inflation, economists say, have spurred many affluent Argentines to move their money into American real estate by expensive and sometimes illegal means. Economic and political uncertainty around the globe are benefitting real estate in the United States, especially in Miami and New York, the two “safe haven” American cities foreign investors usually look to first. South Florida’s real estate market is certainly no stranger to capital flight from Latin America. But the velocity at which some Argentines are investing in Miami real estate has shocked some brokers here. The government of Cristina Fernández de Kirchner, Argentina’s president, has been trying to stop the capital outflow, which nearly doubled to $21.5 billion last year from $11.4 billion in 2010, with increasingly severe methods. Argentines now have to submit requests to tax authorities to convert pesos into dollars for overseas trips, and are rarely approved for much. Overseas credit card purchases are heavily taxed at home. And specially trained dogs working for tax authorities are sniffing for dollars at ports, airports and border crossings. The government began restricting access to dollars last November, days after Ms. Kirchner won a second four-year term. What’s driving all this? Argentina has struggled to preserve its hard-currency reserves in the Central Bank and sustain a trade surplus. The country has had limited access to international credit markets, owing to its inability to win back the confidence of global investors after its $100 billion default in 2001. The government has refused to take on more debt, to rapidly devalue the peso, or to reduce spending, which it needs to sustain programs for the poor and working class that make up its voter base. Instead, Ms. Kirchner’s government has chosen to clamp down on capital flight by whatever means possible. Banks in Argentina are lending at rates some 10 percent under the inflation rate, economists say. There are few profitable investments left in the country, said Eduardo Blasco, a financial consultant in Buenos Aires. Argentines are buying foreign properties not only to park their savings but also to make extra income through rentals. “Argentines don’t want any more Argentine risk,” Mr. Blasco said. So they are willing to risk their savings on Miami real estate instead. 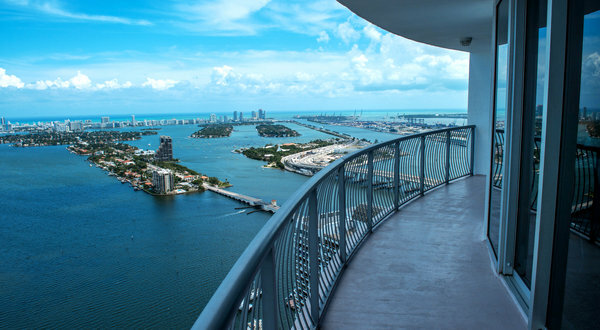 At Opera Tower, at 1750 North Bayshore Drive, half of the 30 apartments sold in the past month were bought by Argentines, Ms. Sanchez said. Most were all-cash purchases, even though the developer, Florida East Coast Realty, has offered to finance up to 65 percent of the purchases. After selling about a third of the building’s 635 apartments before 2008, the developer turned the building into rentals after the housing crisis. Six months ago, Opera Tower began selling condos again. Since then some 90 apartments of the remaining 394 have gone into contract, said Luis Espinosa, the director of marketing for Florida East Coast Realty.